If you are looking for a spiritual community of loving and caring people, you have come to the right place. Our community is made up of people, like yourself, who have been led to Unity by Spirit. We are all here because we’re on a spiritual journey to become all that we were created to be. Columbine Unity is accepting of people of all religious backgrounds and beliefs. We welcome people of all creeds, sexual orientation and social background. There are no exceptions in our welcome to everyone. In Unity we don't tell people what to think. Rather, we offer tools that individuals can use to create lives of meaning and purpose. It’s an exciting time to be here because positive, empowering transformation is occurring! Please come and check us out. A warm welcome awaits you, and when you’re ready, we’ll support you in making friends and finding ways to have meaningful connections within our community. If you have questions, please contact me. I look forward to meeting you. 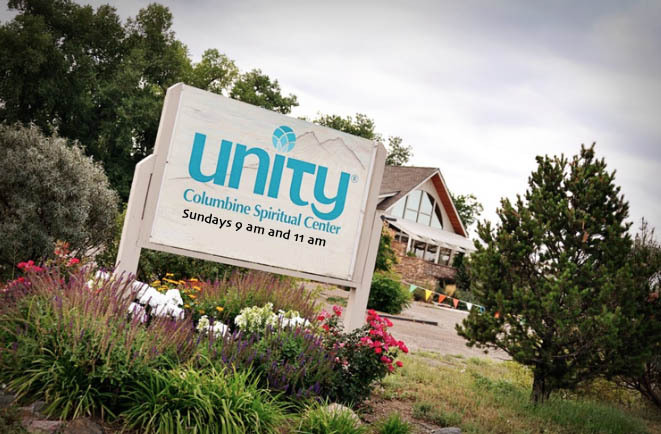 Columbine Spiritual Center is a Christ-centered gathering place of peace, power, beauty, and diversity and is committed to recognizing and magnifying the expression of Christ in all people. Community - We recognize and magnify the power of coming together in love. Spirit-Led - We open ourselves to God's guidance and faithfully live it. Inspiration - We bring out the best in ourselves and others. Authenticity - We align our actions with our genuine beliefs, principles, and intentions. Inclusiveness - We embrace all people as expressions of God.